Above scan is of the cover of no. 24 (dated Apr. 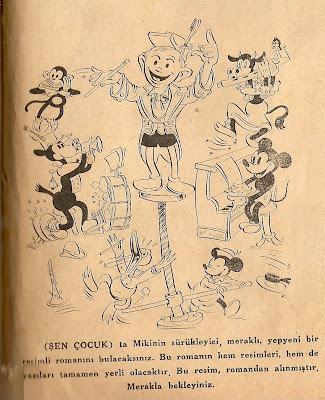 24th, 1946) of a little-known Turkish children's weekly magazine titled Şen Çocuk [Merry Kid], showcasing Pinocchio and Jiminy Cricket alongside Laurel & Hardy as well as a bunch of Turkish comics characters featured in that magazine. 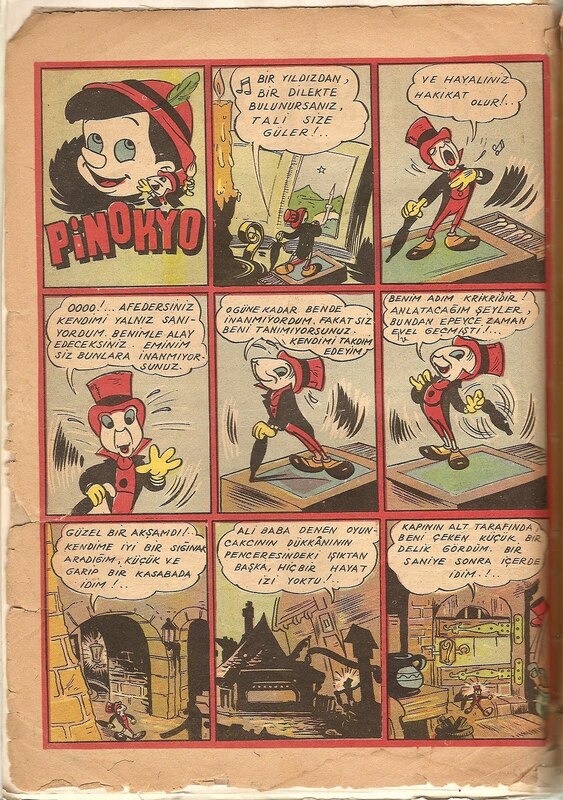 Şen Çocuk had began to serialize the first comics adaptation of the feature-length Disney animation movie Pinocchio (1940), originally run in the US newspapers in 1939-40 as a Sunday half-page comics on the eve of the movie's theatrical release, from its first issue (Nov. 14th, 1945) onwards. 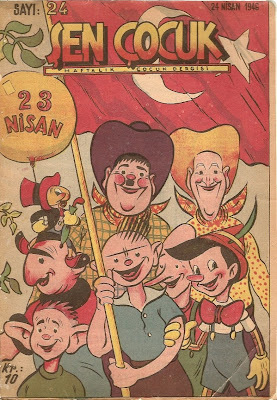 As can be seen from a comparison of the first installements in Şen Çocuk (above scan) and the US newspapers (below image, taken from the outducks archive), the Turkish magazine had produced a traced version with panels of reduced length in most cases, causing a loss of detail and overall decrease in the beauty of the original art. 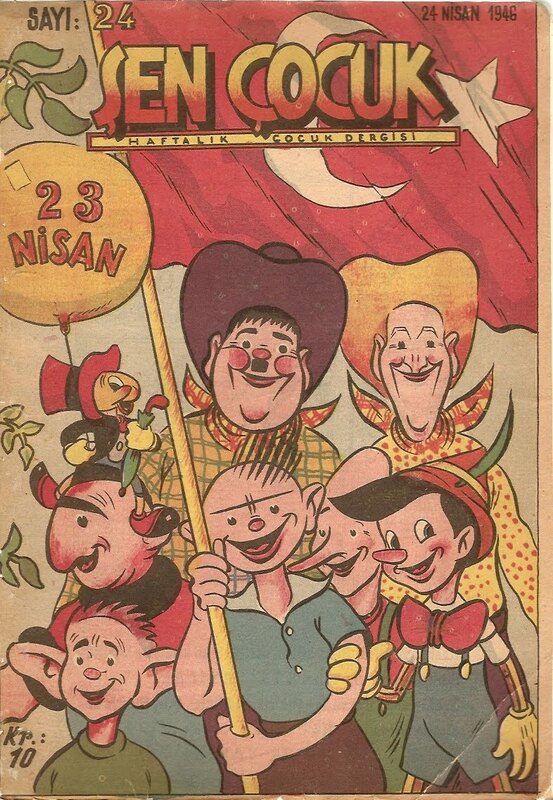 The practice of tracing would be very common in cheap Turkish comics publications of the post-war era. 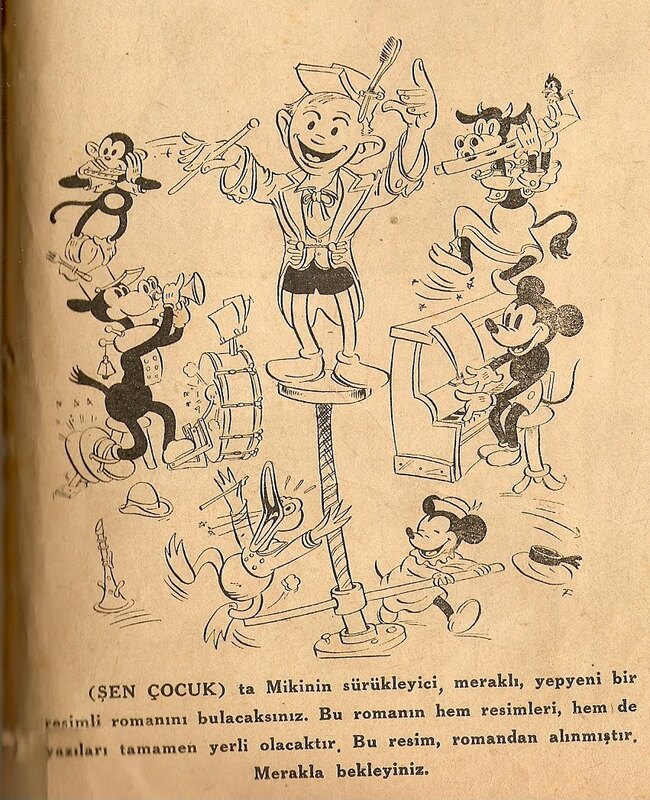 The first issue of Şen Çocuk had also promised a locally-made Mickey Mouse comics for the coming issues, but that promise wouldn't materialize in the next 23 issues and I don't know if the magazine continued publication beyond the first 24 issues available in my collection. 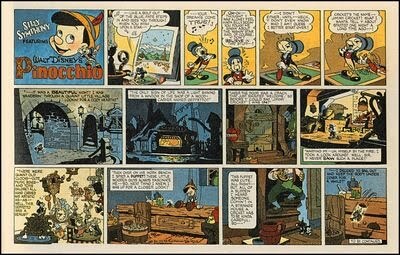 By the way, the art in this promo for the promised Mickey Mouse comics is a reworking of the cover art of no. 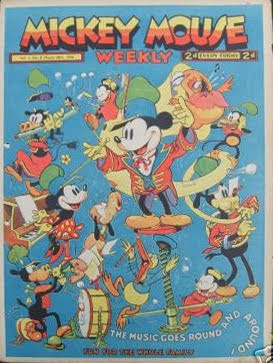 8 (dated March 28th, 1936) of Britain's Mickey Mouse Weekly.